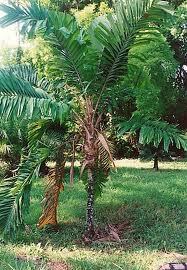 Astrocaryum includes approximately 50 species of solitary palms from rropical America. They grow in moist forest understory. Leaves are pinnate. Male and female flowers are on the same plant. Some species are utilized for oil or fiber. The genus name probably alludes to the starlike fibers arranged around the pore openings at the end of the fruit where the embryonic root emerges. These armed species are not commonly cultivated though they make formidable barrier fences. Mexico to Honduras. Solitary palm to 8 ft, zones 9-11. Blooms intermittently in warm, wet months. Regular moisture and humidity. Fertile, well drained soil. Full to part sun or bright broken light. Flowers: unisexual, small, brown and white, inflorescence compact, branched, fruit ovoid, woody, to 2 in.long, bracts one, spiny. Leaves: pinnate, in one rank, dull green, leaflets unevenly divided, petiole and rachis spiny. Stems: heavily armed with long spines.